The design is similar to, and intended to replace the highly successful 'Pioneer' and 'Ranger' designs created and built under the supervision of our manager from as early as 1979. Improvements include more cabin volume, easier passenger access, larger propellers (quieter), more power, protected cooling system, twin lift fans and easier maintenance procedures. 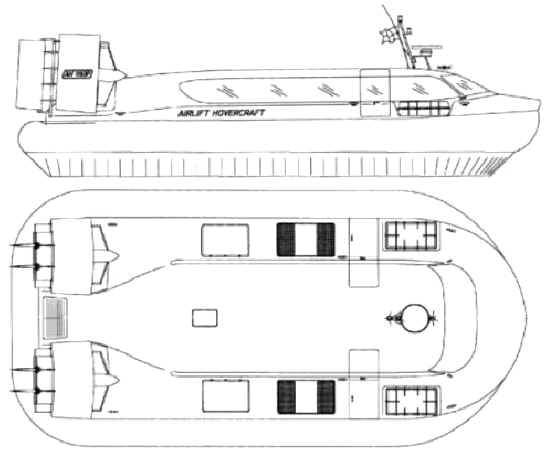 The '1160P' was designed to fill a requirement for a fast passenger carrying hovercraft in the 25 to 29 passenger size range with more comfort, style and performance than any competitor can offer. The design is based upon the well-proven ‘890P’ standard version and has proven outstandingly successful. Emphasis has been placed on the commercial requirements of operators such as good payload, good all year weather capability, economical to operate and maintain, durable and simple construction and above all, good economical viability for its owner. The basic design is capable of conversion to other applications such as freighter, seismic survey, well deck with front ramp, convertible cabin, field ambulance, military patrol etc. Payload 3000kg (includes additional fuel + passengers + freight) May be overloaded with reduction in performance. 480 kg available with reduced payload. Lift fans 2 - double entry centrifugal fans mounted under the deck. Hydrostatic motors direct drive. Lift fan transmission Hydrostatic variable displacement pump mounted directly to eng. crankshaft, fixed displacement bent axis hydrostatic motors mounted directly to fan shafts. Control is driver adjustable and automatic. Good cooling & filtration (3um) and conservative pressure & speed ratings ensure excellent durability. Thrust system Two ducted low speed propellers, toothed belt mechanical drive with clutch. All items easily obtainable and replaceable. Control system Dynamic pitch, roll and yaw control surfaces, hydraulically power assisted and linked to ergonomic hand control (patent pending) by sealed cables. The hull, deck and superstructure are a vacuum-formed laminated sandwich composite of PVC foam skinned with fibreglass and Kevlar reinforced resin. It has been proven to have superior stiffness, toughness and the best strength to weight ratio with very low maintenance requirements. In the event of damage it is also easily repaired. Thermal and sound isolation properties are also high for this construction system. All laminating is conducted with active quality control procedures to ensure the highest quality. The hull construction complies with or exceeds the Australian U.S.L. requirements. Exterior finish is provided with a high gloss two-part linear polyurethane marine paint to customer specified colour. The ‘1160 P’ is powered by the new technology Deutz BF6M-1015C diesel engine of V6 configuration, turbo-charged and inter-cooled. This is a very smooth running engine which has been engineered by to exceed the requirements of the tough upcoming new European environmental standards and to provide excellent fuel economy in an engine which has a very good power to weight ratio. The 11.906 litre engine is conservatively rated at 330kW at 1900 rpm. With good maintenance this conservative rating can be expected to return the owner a life of more than 15,000 hours between major overhauls. Propulsion is provided by two propellers mounted at the rear of the hovercraft and operating within aerodynamic fibreglass ducts. The propellers are of the wide blade slow speed type for minimum noise generation. Normally fixed pitch propellers are used, however both adjustable pitch and variable pitch types are available if required. Propellers are of our own manufacture in either laminated timber or carbon/epoxy composite as required and are therefore economically available and repairable. The double entry centrifugal lift fans draw air from deck level and discharge it down into the skirt bag. The fans are designed and built for the ‘1160 P’ to ensure efficient and proper matching of the fan characteristics with the air cushion requirements. These fans run at slow speed and are very quiet in operation. The fans are directly coupled to hydraulic motors. A variable displacement pump mounted on the engine supplies hydraulic oil to the motors. An adjustable controller senses the lift fan speed and automatically adjusts the hydraulic pump output to compensate for variable fan load and variable engine speed thereby maintaining the fans at a pre-set constant speed. This system allows the operator to use more or less power for thrust as required without concern for over or under supply of lift air as dictated by constant ratio mechanical drives. The hovercraft is therefore both easier to drive and more efficient. The hydraulic system parts are selected from world wide manufacturers’ standard inventory. Any local competent hydraulic serviceman can provide Service for this equipment. All fluids are S.A.E. specified and commonly available. Ergonomic hand control unit that controls rudders and independent elevators in one unit. New operators adapt easily to this unique system. The engine throttle lever mounted beside the operator’s seat. An auxiliary engine foot throttle for quick response when manoeuvring in tight locations. Lift system hydraulic controller mounted on throttle hand lever. Ballast trim system for use when running the hovercraft light. Auxiliary systems controls are mounted within easy reach of the operator’s seated position, including fuel selection, screen wipe and wash, fire control, indicators and warnings, communications and navigation aids. The skirt system is a fully pressurised tapered bag and segment type and provides the maximum hardstructure clearance, superior stability and rough weather performance. The bag is divided into sections which are bolted together to minimise cost and maintenance effort when damage or wear requires replacement or repair. The skirt fingers are independently bolted to the bag for easy servicing. The skirt bag is inflated to a higher pressure than the main cushion thereby allowing the correct distribution of air from the bag to the cushion and enhancing the high speed operation of the ‘1160 P’ in rough water conditions. System voltage is 24 volts DC. Power is generated by a single 28 volt 55 amp alternator is mounted on the front of the engine. Circuits are protected by re-settable circuit breakers rated to US mil specs. Electrical cable is tinned copper with 105oC rated insulation and routed within conduits and fully sealed where appropriate. Two sets of starting batteries and one emergency services battery are connected to the electrical system via double pole isolating switches which enable selection of either starting battery or isolation of the emergency battery as required. Windscreen wipers with pantograph arms are provided for the front windscreens. A water reservoir with pump provides ample screen washing to each wiper. The navigation lights comply with the requirements of the Australian U.S.L. code and IMO recommendations. Ample provision is made for accommodating communication and navigation aids. Other system voltages are available to special order. The engine room and electrical cabinet are protected by a F.E.A.S. fire detection and smothering system with a warning and selectable auto/manual controls mounted at the control position. The cabin is equipped with portable fire extinguishers. Additionally the internal surfaces of fire zones are treated with fire retardant finishes. Provision is made in these zones for ventilation isolation. The communications radio is normally an VHF marine type. Other radios may be fitted as well as a mobile telephone and an internal P.A. system if required. Compact marine radar and GPS systems may be fitted according to the customer's specifications, provided it is compatible with the craft's electrical system. A 100mm-card compass is fitted to the dash top. Elevators for pitch and roll control are mounted directly behind the ducted propeller units. Each elevator is independently controlled and may be used to compensate for gusting winds, moving loads or in anticipation of waves or obstacles. Co-ordinated movement of both the elevators and the rudders greatly enhances dynamic stability and manoeuvrability. This system interacts with the higher than normal skirt clearance to provide the ‘1160 P’ with the ability to operate in adverse weather conditions exceeding the capability of any other similar sized hovercraft. The additional control available enhances operation in tight and confined areas. Rudders and elevators are hydraulically power assisted to reduce operator fatigue.